Several female New Zealand members of parliament were kicked out of a meeting on Wednesday for “flouting the rules,” after revealing they were victims of sexual assault. During that session, various MPs were debating what to do with New Zealand citizens and convicted criminals (mostly of low-level crimes like marijuana supply and shoplifting) who are being detained on Christmas Island after Australia introduced a law retroactively canceling their visas. According to The Guardian, three-quarters of Labour MPs walked out of the session after Key’s remarks. When other female MPs, including Labour’s Nanaia Mahuta, Clare Curran and Megan Woods, along with Green MP Marama Davidson repeated the call for Key to apologise with reference to their own assaults, [speaker David Carter] ordered them to stop, saying they were “flouting the rules” by claiming to make points of order. Despite the warning, the women continued to speak until Carter had them removed from the House. At least eight others, including four men, joined them. Carter now says he hadn’t heard Key’s comments when he ordered the women to leave. 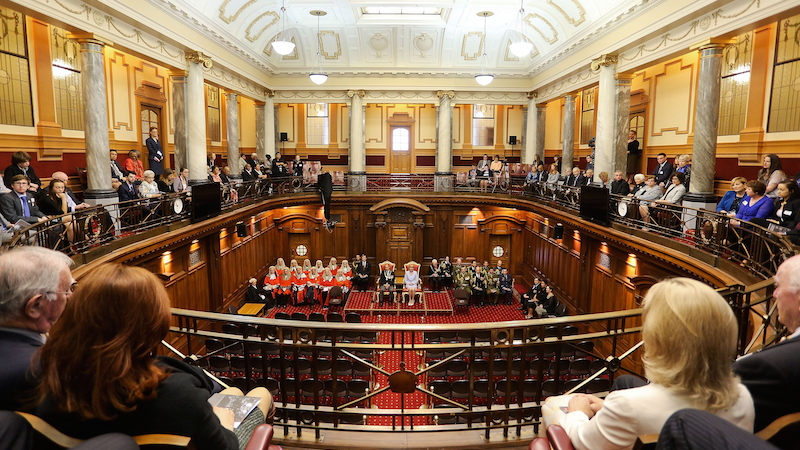 Image of New Zealand Parliament via Getty.